The USA loves its festivals. Every type of music, food, art, craft, fashion, sport and niche hobby seems to have a celebration somewhere in the US, some running along predictable lines, others straying into decidedly quirky territory. Plaid-wearing festival? Check. French festivals? Mais oui, bien sûr. Pirate festivals? Aye, those too. 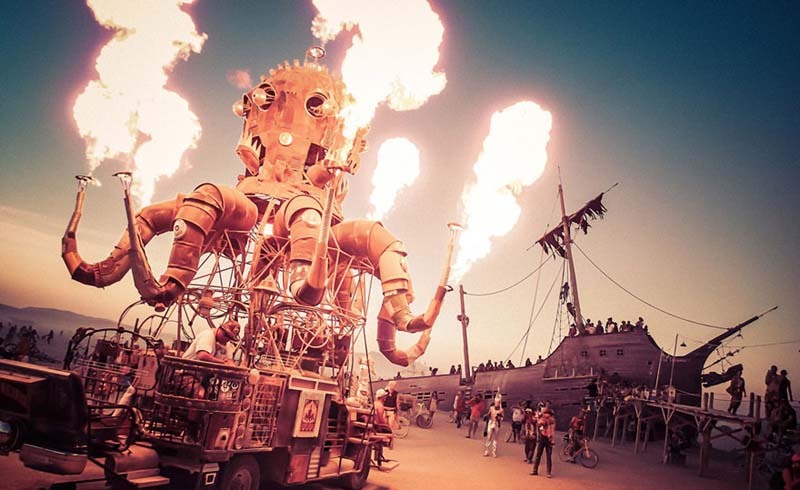 There's no getting around it: some festivals are quirky for quirky’s sake. (We see you, cow chip throwing contests and outhouse races – and please, carry on.) At times, however, a festival’s quirkiness is no mere act: it stems from local history, old traditions, and a desire to preserve the things that make a place special. These seven uniquely American festivals and events might seem odd at first glance, but give them a try, and you might just come away knowing the place – and the country – a little better. 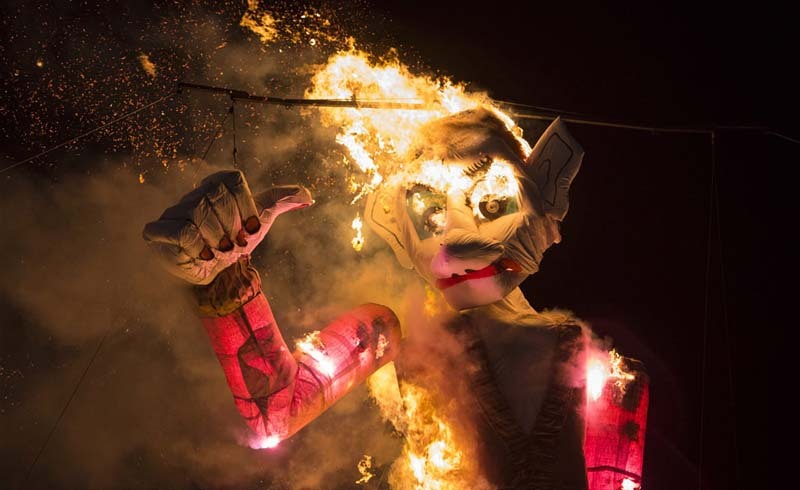 Yes, there’s that other festival in the West that ends in the spectacle of a burning man, but it has a much older forbear in Santa Fe’s annual Burning of Zozobra, a fiery event that marks the beginning of the Fiestas de Santa Fe. Having vanquished the evil creature, the world is now free from gloom, and the party gets underway with dancing and music. But don’t let the festivities fool you: Zozobra will rise again next year. A mustachioed man with a deep Sam Elliott drawl stands on stage reciting a witty rhyme about a horse. Next up, a psychedelic beat-poetry paean to small-town America, followed by high schoolers bravely reciting challenging poems from memory, Basque bertsolaris singing improvised verses, and a deep dive into the history of black cowboy music. Make the trip to the middle of Nevada in the dead of winter for the annual National Cowboy Poetry Gathering and you’ll see all of these and plenty of great hats, too. What is cowboy poetry? As one poet put it, it’s a poem a cowboy likes. The gathering has been taking place each year in Elko since 1984. You don’t have to be a cowboy (or cowgirl) to participate: the open mic sessions welcome all comers brave enough to mosey up and give it a try. The National Cowboy Poetry Gathering is as pure a slice of America as it comes, but it welcomes a global cast of cowboys; previous gatherings have celebrated the cultures of Argentinian gauchos, Hawaiian paniolos, Mongolian horsemen and more. If you know your way around a horse, you’ll fit right in. It’s hot. There are men with beards milling about. Mature men who seem to enjoy a drink. They bear a striking resemblance to each other. This is the Hemingway Look-Alike Contest, a standout tradition of the annual Hemingway Days in Key West, celebrating the most storied author of the Conch Republic. It takes place at Sloppy Joe’s Bar, a Papa favorite. The judges look for older, heavier-set men with full beards. Entrants must not only look like Hemingway, they must sound like him as well, and there are rules: no hats, no balloons, no animals on stage. Just you, your beard, your courage and your truth. No beard? No Y chromosome? No worries. 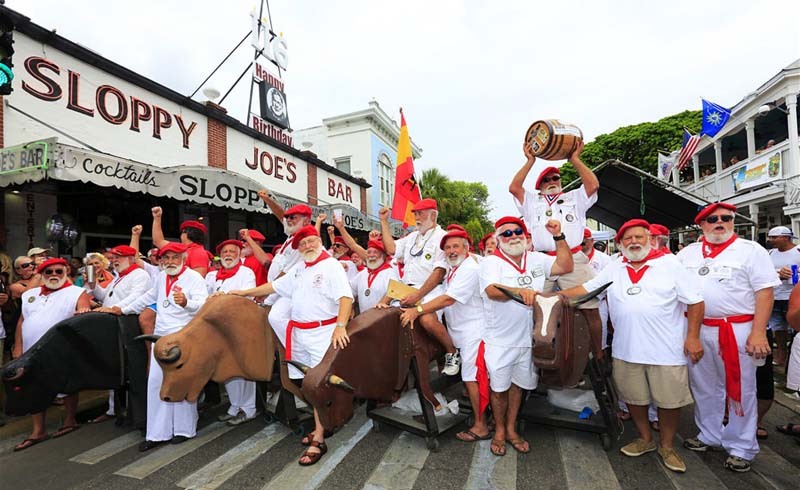 Other events include a “Running of the Bulls” with faux bulls, live readings, talks on Hemingway and his legacy, and even a fishing tournament. Logan, Ohio, in the Hocking Hills southeast of Columbus, is the home of the Columbus Washboard Company, the only washboard manufacturing company in the US still in business. Almost no one uses a washboard for doing laundry anymore, but the tradition of using them as percussion instruments is alive and well, a tradition celebrated each Father’s Day weekend at the Washboard Music Festival. Musical acts cut across traditional American styles, including jug bands, Dixieland bands, zydeco bands, bluegrass groups and anyone else that wants to add the distinctive rhythmic clickity-clack to their sound. The festival also includes a variety of local arts and crafts, a quilt show and an antique tractor show. Rise and demand liberty from England! Denounce the preposterous tea tax! Wear a hat with at least two corners! Then march to the wharf with your fellow colonists to watch as a brig is boarded and its cache of tea is ceremoniously dumped into the harbor. 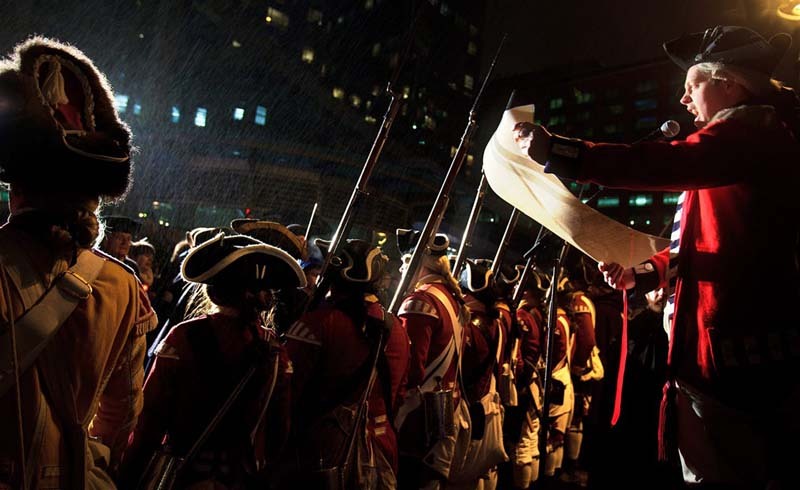 Every year, Boston celebrates its most famous moment, the day in 1773 that sparked the American Revolution, with the live Boston Tea Party Reenactment. This is no mere spectator event: over 100 re-enactors in full costume make everything run smoothly, but they depend on people like you to help recreate the (playfully) angry mob that formed on that December night long ago. Immerse yourself in history and join the debate in the Old South Meeting House whether you’re wearing a tricorne or a Red Sox cap. The event is so popular that it sells out every year, so be sure to reserve your tickets (and appropriate costumes) in advance. For most cities, festivals on the scale of Mardi Gras and JazzFest would be more than enough for a year. Most cities are not New Orleans. On the first Saturday evening of August, put on your finest white linen outfit and join the crowd strolling Julia Street in the Warehouse District for the largest art gathering of the year: White Linen Night. Why white linen? In the days before air conditioning, local residents had to find ways to stay cool (and look cool). The answer: white to reflect the heat, and linen for its breathability. You don’t have to wear white linen if you prefer to make an alternative artistic statement (or, say, if you’re traveling and somehow forgot to pack a full white linen outfit) – there will be more than enough white to go around. If you do wear your finest whites, don’t worry if the linen gets a little grubby by the end of the night: one week later is Dirty Linen Night on Royal Street, a cheeky play on White Linen Night featuring dirty martinis and dirty rice on another of the Big Easy’s artsy streets. In 1928, the town of Angels Camp held their first official frog-jumping contest as part of a celebration of the newly paved Main Street. This idea didn’t just leap out of nowhere: Mark Twain had earlier written a short story, “The Celebrated Jumping Frog of Calaveras County,” so the town decided to bring their literary claim to fame to life. 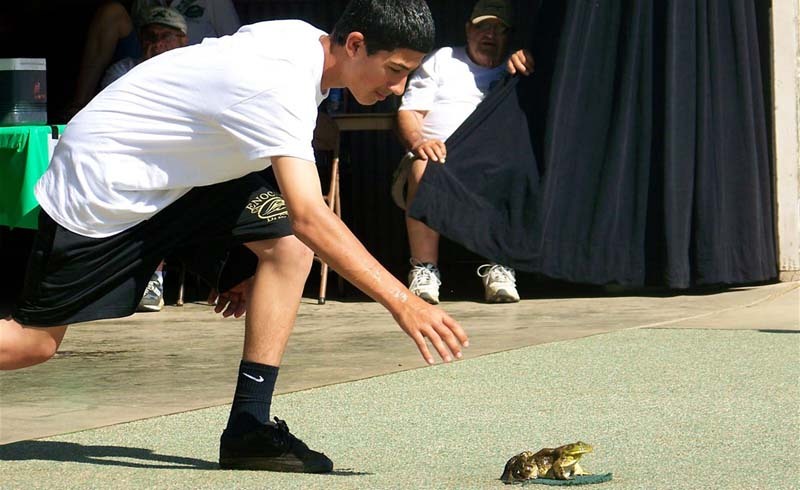 The tradition continues today as part of the Calaveras County Fair & Jumping Frog Jubilee. With the rest of the County Fair happening, not all attractions are purely herpetological. Live music, carnival attractions, talent shows, bake-offs, a variety of craft competitions and wine tastings from one of California’s up-and-coming wine regions will keep you busy when the frogs aren’t jumping. Want to give the frog jump a try? This is no BYOF affair: simply show up, purchase an entry and a frog will be provided. Give your frog some gentle words of encouragement and hope it beats the record (21 feet 5.75 inches) set by “Rosie the Ribeter” in 1986, a year when over 3000 frogs competed. If only Mark Twain could see his legacy.